When the white cotton duvet cover arrived at my front door, I knew that dressing the bed was FINALLY done! The Gable Guest Bedroom is a little jewel-of-a-room! It’s vaulted ceilings and big gable window contrasts with its smallish size and interesting angles to make a very cozy, cocoon-of-a-bedroom. All of the furniture in this bedroom is antique or vintage.. collected over years and years.. and my very favorite piece is this big, real-deal iron bed. The double bed has a scrolly frame that at one point was probably painted. When it came to me 18 years ago it was this dark natural color. I kept the bedding calm and white to show the bed’s great detail. I think the large handpainted canvas above the bed is coming down and going somewhere else in the room (or not in the room at all). I am not quite sure what is going above the bed yet. Something updated. Any suggestions? I am also looking for wall sconces for each side of the bed. The bed is tucked in a perfect little nook… just right for this double bed… but there is no room for a side table with a lamp. I might like brushed metal sconces with white shades to bring light to my guests who like to read in bed … just thinking outloud! I am not a fast worker when it comes to decorating a room. I need time to dream and think and collect and buy and try and edit and add and fuss… and fluff! October 1st is my Finish Line date. I have a lot to do in this little room by then! This is beautiful. Thanks for sharing on Marvelous Mondays! Love that beautiful bed. White really does show the awesome design of the bed. You have a beautiful room for your guests. I love this room. The white bedding is perfect. My favorite touch is the linen bedskirt. I noticed the plates over the window and wonder how something to echo those shapes would look, such as round mirrors over the bed–but that might be too much. Platters? A decorative piece of iron, something with scrolls perhaps, or a wooden fragment with something sculptural, might look nice. A couple of old scrolls with a shelf over is another idea. Will your sconces be on the back wall or on the sides? Is there such a thing as a light with a little shelf over it? I’m just thinking of reading in bed and needing a little spot for my glasses. Looking forward to seeing the chair. Just a thought: Could you put a table behind the bed like we put sofa tables behind sofas? And put lamps and stuff on that? Maybe it could fit into that little space behind the bed and between the two walls. Your room is so beautiful. I’m so glad you talked about dressing the bed-that’s exactly what I’m working on with my room. It is so inviting. ooohhh…I love the bed, soft pink walls, draperies, linens…everything!!! Wall-mounted lights are the perfect solution. Your bed is really pretty. 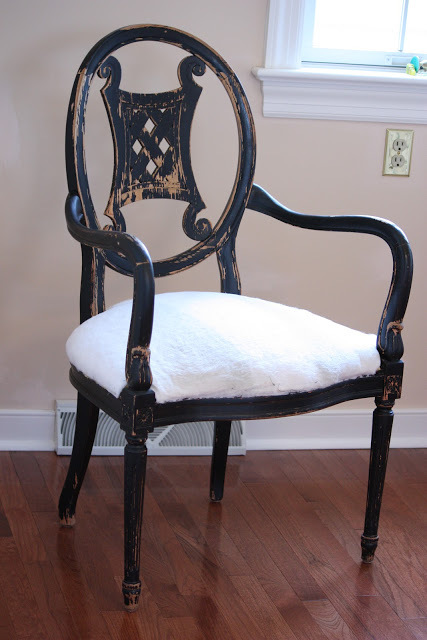 So beautiful and comfy-cozy; makes me think of a wonderful chic country cottage. You asked for suggestions… I think maybe some of those beautiful white plates with the eyelet trim with maybe a beautiful ribbon through the eyelets, or maybe a beautiful antique rose pattern plate(s) with some of the white plates. Or maybe rose tea-light wall sconces. 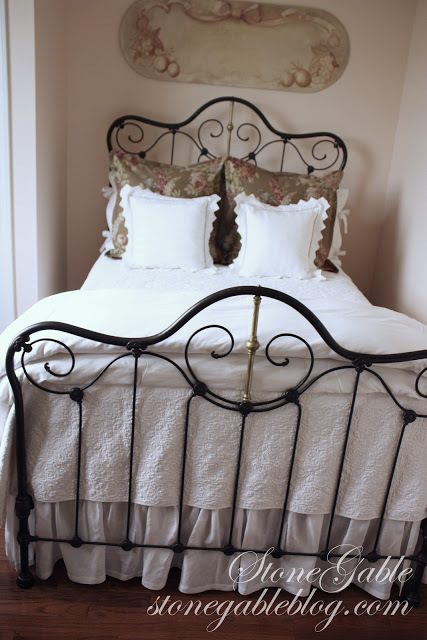 love the black iron bed and the quilting is gorgeous! Anyone would be tickled to have a stay in your lovely guest room. It looks so cozy and inviting. I especially like that the bed is tucked into its own little nook. In addition to the sconces that you plan to add, wonder how a very small and shallow little shelf would work on each side of the bed? Simple, painted white and rounded maybe? I know that when I’m in bed I really like having a place for a clock or a place to put the book that I read before I fell asleep. Whatever you do, I know if will be just perfect when you’re finished! You have just given me a great idea! I’m thinking of making some changes in our guest bedroom, and I’m thinking this all-white look may be the answer! I’m looking forward to hosting guests next weekend. 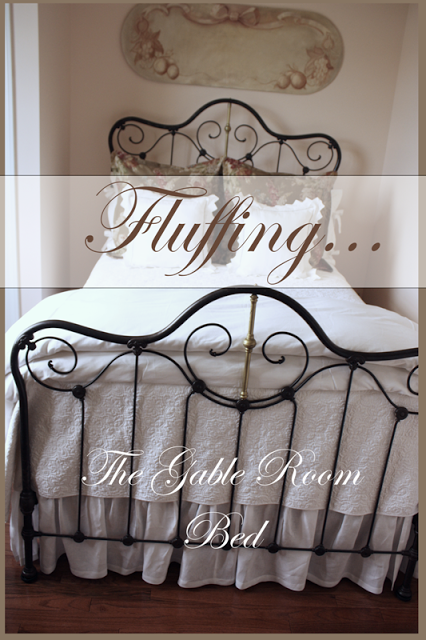 Why is it that the guest room always looks great until you have a ‘reservation’ and then….it always seems to need some fluffing? I love what you’ve done….can’t wait to see the finished product. Beautiful bed Yvonne…just love the pattern on the shams…and that chair is the greatest….Great design is not rushed…you seem to always carefully plan your design and the end result is always perfection!…I look forward to all the beautiful and creative things you will be doing in the room! I always think that the best way to know if a guest room works is to sleep onit yourself. Personally I love the linens you chose. If you want the bed in the nook, than tables for a glass of water or eyeglasses will be impossible. Unless you can find those small metal tables at Hobby Lobby that would fit in there. And then install lighting in the wall for reading. The other option would be to put the table under the window in the nook and make it a reading nook with a chair and place the bed under the window so you have room for end tables. These are thoughts, but I do think nightstands are essential. It looks beautiful, Yvonne! A great guest room, too, because it works for both your male and female guests. I love your quilt! I’ve been looking for a nice white one myself. Love the idea of sconce lights or wall mounted lamps. So many options with those, but as someone who likes to read before I go to bed and with no room for side tables, I think that is a great way to go. 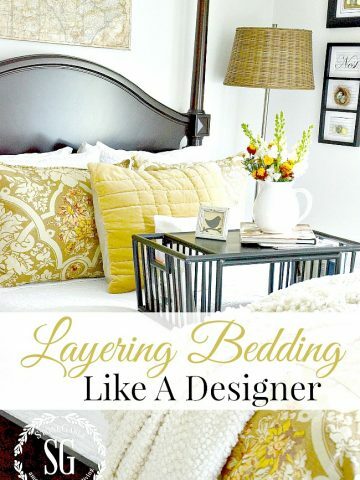 What a perfect “frame” your nook is for that beautiful bed Yvonne and the white just makes it seem so inviting. The sconces will be perfect for your guests to use for reading and I think using a little “bling” with the addition of either brushed or polished nickel will add the right balance. I guess it would depend on what you decide to use over the bed whether what finish the scones should have. Thanks so much for sharing. How beautiful. Your guests must really enjoy their room. I’m interested to see what you do with that pretty chair. What is your paint color in this beautiful guest room? It’s very pretty! Yvonne, such a soothing and sweet bedroom. And cool looking too, just right for this heat. Something to consider for the reading lights are little swing arm wall lamps. We have some in our guest room and our company loves that they can angle the light right over what they are reading. It is beautiful Yvonne, very comfortable and classic. 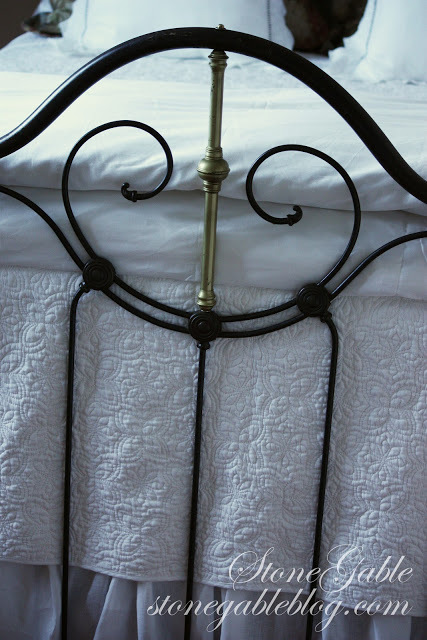 I love your iron bed! I know I love to read in bed so sconces would be nice. I love the bedding! All white is my favorite. The chair is awesome! Such a cozy and relaxing room. 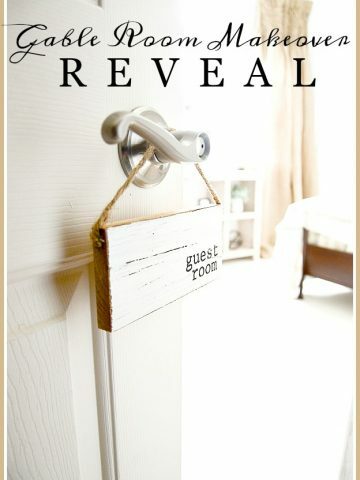 I want to come use your guest room! 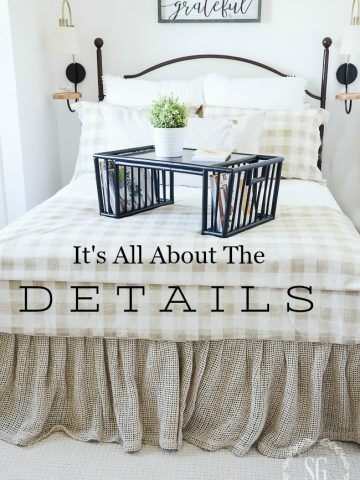 It makes me think of how Anne of Green Gables was in awe of guest rooms… yours is beautiful but also looks so cozy! I think sconces are a perfect idea, especially if they are dark like the bed and the little table. One more dark accent. Pretty pretty room and I love the finish on that chair. I hope you leave that. So beautiful. 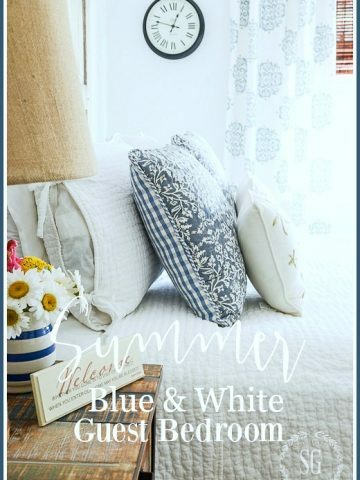 Such a calming room with all of the white, and I absolutely love the print fabric you used for the shams. I think a grouping of plates to pull in the soft green of the fabric would be beautiful. Maybe surrounded by a large white platter, etc. Whatever you do it will only enhance the beauty of this room. Your floors are simply GORGEOUS! Why not get one of those written wall quotes to put above it? I love the look of the black iron against the white. Yvonne I would love to be a guest in this gorgeous room! Love the white bedding, it’s so crisp and fresh looking. I did all white bedding on my bed last year and I still love it! Yvonne, We are completely remodeling our bedroom right now. New windows, remaking some walls, doing a walk in closet etc. My headboard is a medium tone wood, with a 8″ high blackish metal scroll attached to the top edge. It is kind of high, and I dont think any heavy artwook would look good. I am planning on take a grapevine swag and adding some flowers etc and hanging it above my bead. I think the swag would kind of echo the the headboards high center and downward slopping sides. I think if your into something like this, yours would look nice like that too. Something simple with just a little muted colors. Your bed linens are wonderful, Yvonne. I have a tablerunner made from that same floral fabric for my Dining Room, and just yesterday bought more for pillows on my sofas in the LR. That’s my next project. Love the floral and the texture of that particular fabric. And the bed is just so beautiful. what a great room!! Yvonne, any guest who visits you is lucky! Wow! So pretty and cozy.. So pretty!! I would add more cream wear plates around the bed~it is sooo lovely! Such a beautiful space! 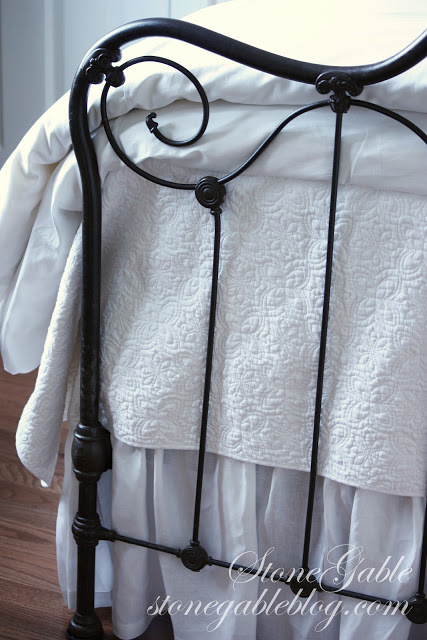 I love the iron bed, and love how the ballet chair echos the curves! They will be so pretty together. Can’t wait to see the finished room. I love everything about this sweet space! You did a wonderful job! I am the same way… I like to take time and add everything in layer by layer, editing and re-editing. 🙂 I am working on my bedroom right now with all white bedding and I am collecting old mirrors to do a mirror wall above my headboard… just an idea for above yours. I really like what is already there, though. It is so pretty! love the room. the bed frame is really nice. OOOhhh how cozy. I feel like I can climb right in and have a snuggle. Love the pop of colour. I am also a slow to put together decorator. I luv the acquired and lived in look. 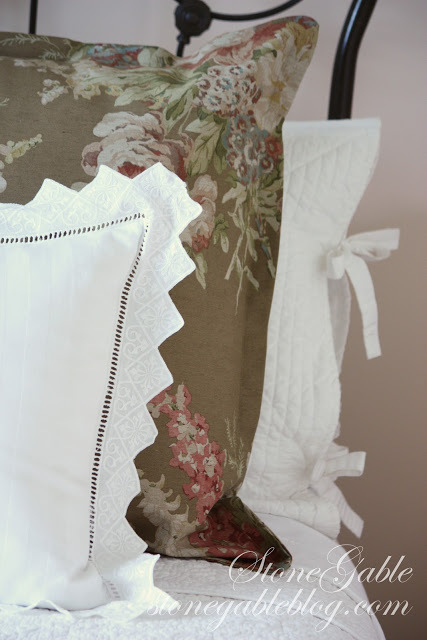 What a magnificient room for your guests @ StoneGable!I love all the white bedding and that iron bed is a true gem!I chose to use shadow boxes here on the Prairie framing my beloved Mother’s baby dress and my beloved Father~in~law’s christening gown. Something vintage above the bed…maybe one of those Victorian oval frames, or a tranquil pastoral scene. . .you’ll know when you see it!!! I adore that you give yourself timelines in your remodeling. Keeps one focused and on task. My kinda’ method, also! Have a wonderful weekend! Your guest room looks cozy. It takes me awhile also to find the right accessories to finish up a room. I am almost done with one of my guest rooms decor. Just waiting for a couple of things from Etsy. Love the pillow shams too! Hope you are having a nice weekend. 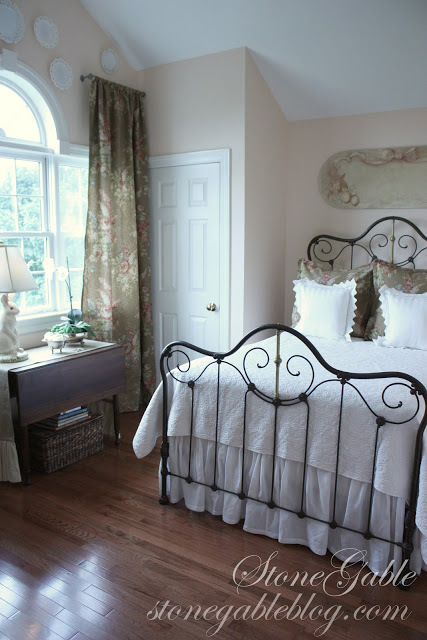 Yvonne, love the bed, love the linens, love the chair, love the window, love the curtains. What’s not to love! A cozy cocoon of a room it is…..love it.